For students at Gaynor, learning can sometimes be a challenge. But they are fortunate to attend a school that provides the tools and strategies needed to help make learning accessible – and through the Community Learning Center (CLC), they’re able to give back. The CLC, started in 2007, is a free afterschool reading program for children in New York City public schools. 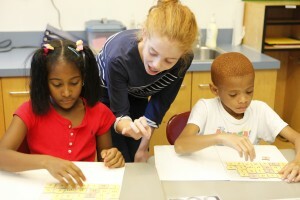 The program has grown from 10 students to nearly 30, demonstrating the need for small group tutoring. For one hour, twice a week, first and second grade students from neighborhood schools, PS 166 and PS 84, gain valuable tutoring lessons from Gaynor staff, with assistance from alumni volunteers and current students. Lessons occur in small groups and teachers draw on their extensive experience with the Orton-Gillingham method, directly supplementing the instruction students receive in their regular classrooms. The CLC provides a boost to the students’ regular program, which can often get them back on grade level and simultaneously increase their self-esteem. The teachers are skilled at creating fun, engaging, yet instructional lessons, evidenced not only by the students’ increased reading skills, but also by the big hugs teachers receive when CLC students enter our lobby each week. Through the CLC, the underserved population gains a chance to stay on track with their studies, while Stephen Gaynor School students have an opportunity to perfect the skills they’ve been taught every day, helping to build self-confidence. On average, 10-15 students graduate from the program each year, with significant reading improvements. Jackie Long Memorial Tourney (formerly known as Shooting for Success): Our winter fundraising event, in memory of our long-time Admissions Director Jackie Long, is a basketball tournament in which alumni, parents, teachers, students, and friends participate. Teams make a donation to play, and all proceeds support the CLC. The event also includes an annual raffle that helps to generate additional funds for the program. Participants do not need to be present to win. Cycling for Success: Each spring, our fitness-minded friends join forces to support the CLC by raising funds to spin on stationary bikes.